One taste of this herb salt and you are going to be in love and you are going to use it for anything and everything this summer–from meats and vegetables to your Saturday morning eggs; you are going to find yourself reaching for it and wondering how you’ve lived your whole life without it! At least, that’s how I felt about it the first time I tried it! If you’ve been reading this blog for a while, you might remember that I learned about this herb salt last year from The Splendid Table. The concept is so simple–fresh, pungent garlic is minced into a couple of tablespoons of coarse kosher salt, then fresh herbs are added, bunch by bunch until you’re left with a verdant handful of the best smelling stuff on earth! Of all the things we planted this year, the herb barrel in the front yard is truly the only thing that can be described as “bountiful”. French Thyme, Lemon Thyme and Red Creeping Thyme are starting to climb out of the barrel and drape over the sides. The basil is abundant! We have Thai, Amethyst and Sweet Basil that have grown so much that even after we harvest it for pesto, it still doesn’t look like we made a dent in it! The sage is trying its best to grow in the shadow of these high achievers; so part of my reason for replenishing my herb salt stash was an attempt to prune some of this crazy growth so that the sage can see the sun again! Next year, I will keep this in mind and space them out a little better! This isn’t so much a recipe, as it is a set of ideas. You can use whatever herbs you choose in whatever ratio seems best to you. 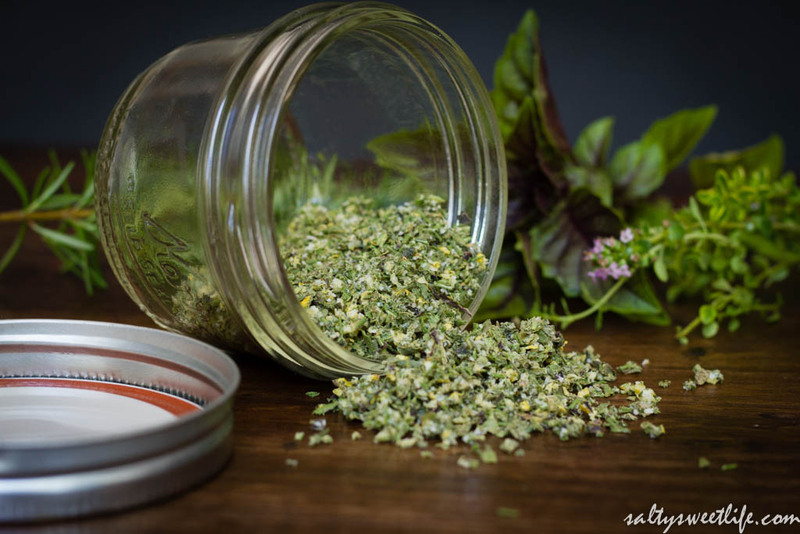 My herb salt reflects the overabundance of basil and thyme, whereas you might enjoy other herbs–lavender, tarragon, oregano. 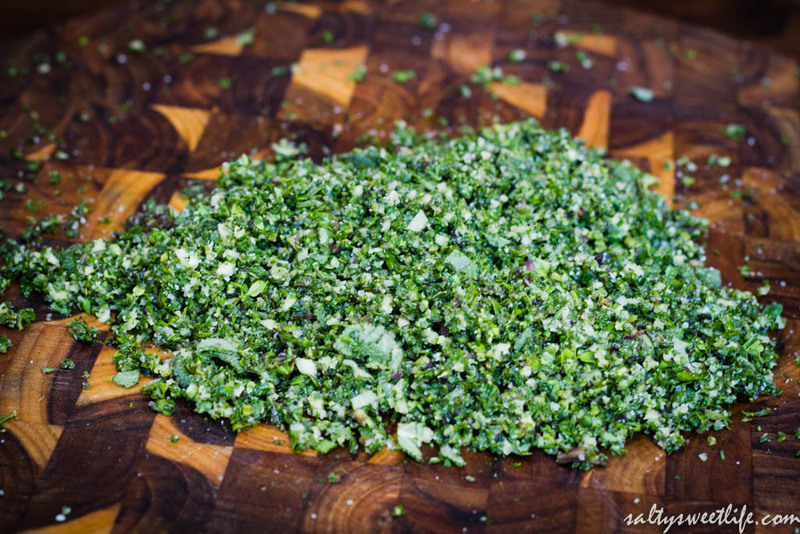 Once you’re done with the initial chopping, you can use the herb salt in its fresh state. I mixed some of the fresh herb salt with olive oil and used it as a rub for a grilled pork tenderloin–so amazing! Then I took what was left and spread it on a baking sheet to dry overnight. 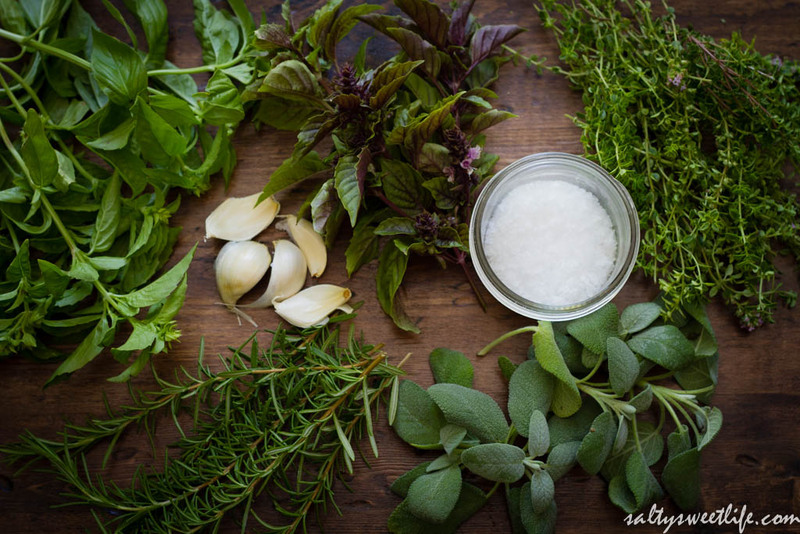 The salt preserves the flavors of the herbs and you’ll be able to use it again and again (and you will, I promise)! I used a combination of rosemary, three varieties of thyme, sage and three types of basil. I chose to do this task by hand, without the help of my trusty food processor, for the simple reason that it was therapeutic. I found myself reveling in the rhythm of the knife against the cutting board, mincing and mincing until every herb was used, finer and finer still, until it was all done and my whole kitchen smelled like it had been transported to Tuscany. It is truly divine. After harvesting the herbs, wash them and then dry them in a salad spinner. 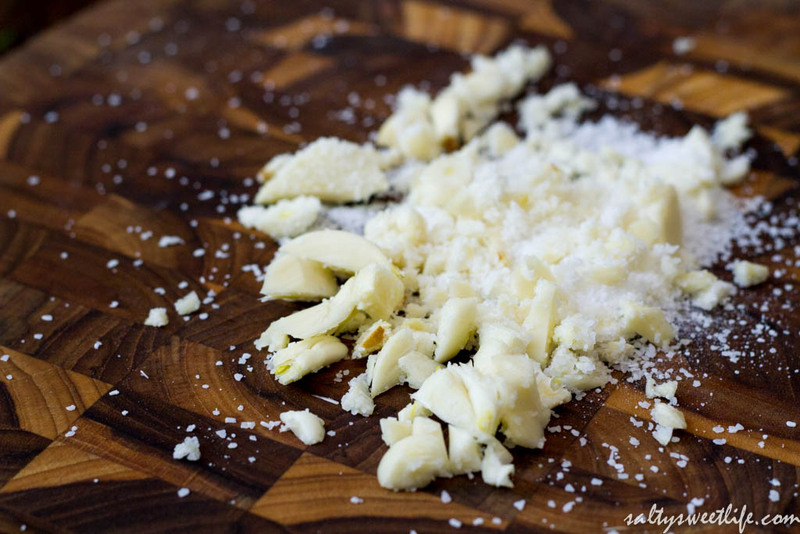 Place peeled garlic cloves on a cutting board along with the salt. With a chef’s knife, mince the garlic into the salt until the garlic is finely minced and the salt is evenly distributed. Pluck the herbs from the stems and mince the herbs into the garlic and salt. Continue chopping the herbs until you have a consistent, fine mince. If using lemon zest, add it at this point and gently toss it into the other herbs with your fingers. Spread the herb salt mixture onto a baking sheet lined with parchment paper and allow it to dry overnight. I live in a dry climate, so this only took one night. Let it dry for a longer period if needed. 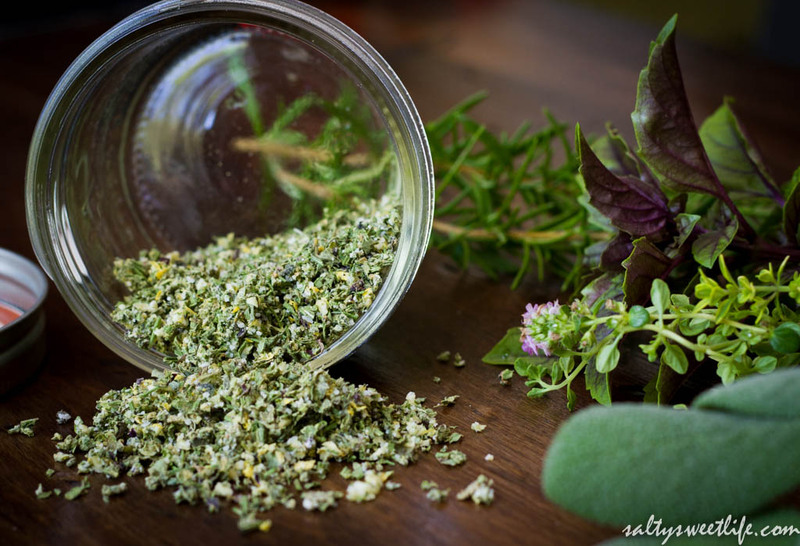 Store the dried herb salt in a sealed container. NOTE: If you don’t have fresh herbs in your garden, of course you can buy them at the grocery store or farmer’s market. Garlic is minced into coarse kosher salt until it’s thoroughly mixed. 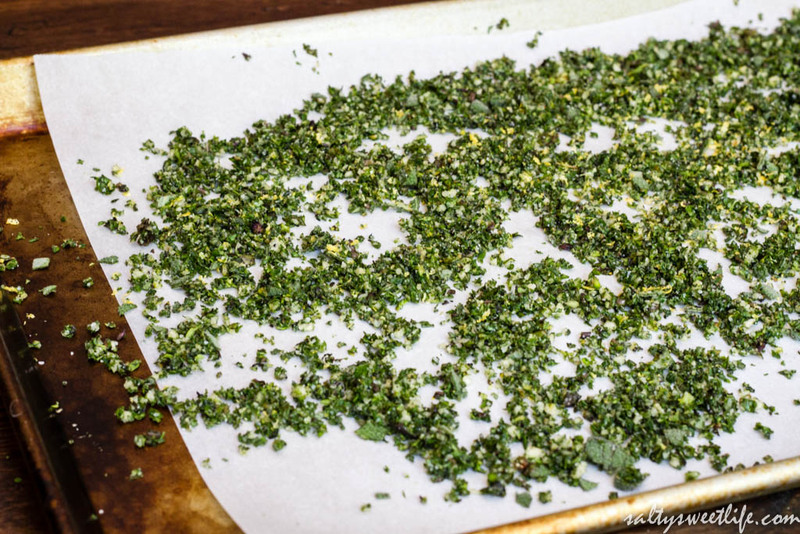 Spread the herbs onto a baking sheet lined with parchment paper to dry. Perfect! My herb garden is going nuts now w these two! What a great way to maximize seasoning! Thanks Dana! It really is a great way to keep your fresh herbs through the winter. Buying flavored salt can be expensive. This would make a great gift! It sure would be! Great idea Julie! My basil was looking healthy and now it is dying… 😦 I love your pictures and the salt! As HostessatHeart said, it makes a great gift! Really love the idea. Great use of the fresh herbs to have some this winter too! Like ‘Hostess’, sounds like good gifts. How long can it be stored? Til Christmas???? I’ve never had it last very long since I use it often but I imagine it could last a few months.